While we sometimes laugh at the idea of "curriculum" in preschool, it seems to be common in the U.S. and U.K. now for parents to expect their kids to learn at preschool, and not just about sharing and shapes. My four-year-old has already learned to write his name, recognize letters, and other basics at his six-hours-a-week preschool. At prices that generally average about $10 per hour in my city, I think parents expect more "school," less "pre-" these days. But on the fringe of traditional education is the "unschooling" or "free school" movement, which has loose connections to the homeschool community, Waldorf, and other traditions that downplay the role of worksheets, tests and memorization in schools, instead choosing to let kids make their own way. And another, complementary (and far more mainstream) movement seeks to greatly increase the amount of time kids get to play outside, called the "Green Hour" or the cure for "Nature Deficit Disorder." This U.K. preschool whose students spend nearly every moment out-of-doors is a unique mashup of the different educational movements for little kids. 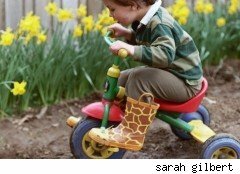 Both the Farley Outdoor Learning Center in Wiltshire, England and the Secret Garden Outdoor Nursery in Fife, Scotland let the kids play outside in very loosely structured learning; rain or shine. What's more, they let them get dirty. While I think the concept of letting kids play outdoors in an unstructured environment for many hours a day, rain or shine, is fabulous (just take a look at the load of laundry I'm doing from the weekend, which looks as though I've hired my not-quite-two-year-old, four-year-old, and almost-seven-year-old out to pick up lost spark plugs at a monster truck rally) -- I'm not sure it's worth paying for in a structured preschool setting. I suppose it's better than the alternative, if the alternative is sitting in a strip mall storefront, pasting foam letters on construction paper while staring at a parking lot; but if the alternative is outdoor play under parental care, I think I'll just pick unschool.